Craig was also kind enough to interview me in return. 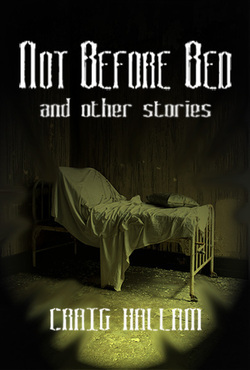 D.H.: Craig, I really enjoyed Not Before Bed - and other stories. Your tales--which range from the frightening to the bizarre--are delightfully eclectic and terribly addictive. What prompted you to write this collection of short stories from the speculative fiction genre? Craig: Glad you enjoyed them! They're actually the product of about two year's work. After writing two novels (which were terrible and will never see the light of day), I went back to the drawing board after having a really vivid idea for the story Upon Waking. I jotted the whole thing down long hand in one draft. I really liked it, so I decided to send it to a magazine. It became my first acceptance! It ended up in the pages of the British Fantasy Society's journal and I caught the short story bug from there. The rest came over a couple of years, some accepted to magazines and some not. D.H.: Did you have any favourite authors growing up? How have these authors influenced your writing? Craig: From the age of 11 I read everything that Terry Pratchett committed to paper. I think his Discworld series are my most re-read books. Then I moved to Stephen King. But the book that really changed the way I saw literature was Mervyn Peake's Gormenghast trilogy. It was so dark and vivid, that was when I knew I had to try writing. I think his twisted characters still influence how I write even now. D.H.: When you write, do you have a schedule and routine? Do you have any writing idiosyncrasies? Craig: I'm actually a terrible procrastinator. I tend to put off any writing until the image has crystalised into something truly immense and is driving me nuts. But if I'm going to write, it has to be first thing in the day. I get up, unwashed, unshaven and unfed and stay that way until the fire burns out and my fingers are bleeding. It's a wonder I'm not malnourished hahaha. It's often 6pm by the time I have my breakfast. D.H.: Which story from Not Before Bed... is your favourite? Please tell us why. Craig: That's a tough one! I always loved Albert which was my ode to H.P. Lovecraft, but no publishers seemed to like it. I think it's pretty bleak, just like most of the British coastline hahaha. I love writing in first person. It gives you a great opportunity to show weaknesses in character and the slow twist of madness is probably the most fun of them all (Come on, you didn't expect me to be normal, did you? hahaha). D.H.: Your story, Lovecraft, was written from the perspective of a lonely female character. Did you have any difficulties writing from a female's point of view? D.H.: Are you working on anything new, Craig? If so, is there anything you can share with us? Craig: Oooh, lots! I've just finished the final (hopefully) draft of my first proper novel. At least, the first one I'm happy with. It's called Greaveburn. It's a gothic fairytale with a subtle Steampunk influence. If you want the intelligent blurb, it's about the grey area between good and evil; how a good person can be driven to madness by love and bad people to heroism by the same. There are a lot of characters and almost all of them change their viewpoint or allegiances at some point based on their platonic, patherly or idiolistic love of one girl. The first few chapters are with a publisher as we speak, so I'm hoping for some positive feedback from there! Eyes peeled and finger crossed, folks! D.H.: And lastly, if you could have dinner with any of your characters from any of your stories, who would it be and why? D.H. Thank you so much for taking the time to succumb to my scrutiny, Craig! Smashwords. Just follow the link here, or click on the book cover. By day, Craig is a mild mannered Nurse from Doncaster, UK. By night (in the bath, stuck in traffic or any other stationary moment) he writes speculative fiction. He's been tackling short stories since 2008 and having a little success with publishing them since. His credits include Murky Depths, New Horizons (British Fantasy Society) and Morpheus Tales among others. Two of his stories will be in the upcoming Children of the Moon anthology from Misanthrope Press, and The Big Book of New Short Horror from Pill Hill Press. So keep a look out for those. He loves to hear from people who have read his stories, so go find him on Goodreads, Twitter, or even drop him an email if you like. He hopes to see you hovering over one of his pages in the near future.